Frogs are a kind of small animal belonging to a group called vertebrates (animals with backbones) known as amphibians. · Frogs can be found everywhere on earth except Antarctica, with almost 5,000 different known species. · Female frogs are hard to find as they are silent most of the time. 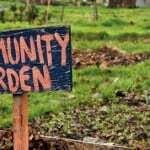 · The reduction of frog populations, especially in Asia and developing countries can actually cause an increase in disease. If there are no frogs to eat the mosquitos, their population goes up, which increases the number of diseases spread through bites. · The purple frog, recently rediscovered in India, has almost no head, a pointed pig-like snout nose and sounds like a chicken when it croaks. Bizarre! · Toads tend to have dry skin with bumps on them. Whilst frogs have smooth skin that’s moist and slippery. · Frogs have a high and long jump, with most of them having an average leap of 2.2 metres! Toads, on the other hand, don’t really jump. They hop from place to place but will run if threatened by predators. 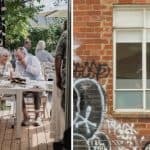 · Frogs have many predators, but the skin of a toad has a bitter taste and scent that burns the nose and eyes of anything that bites it. 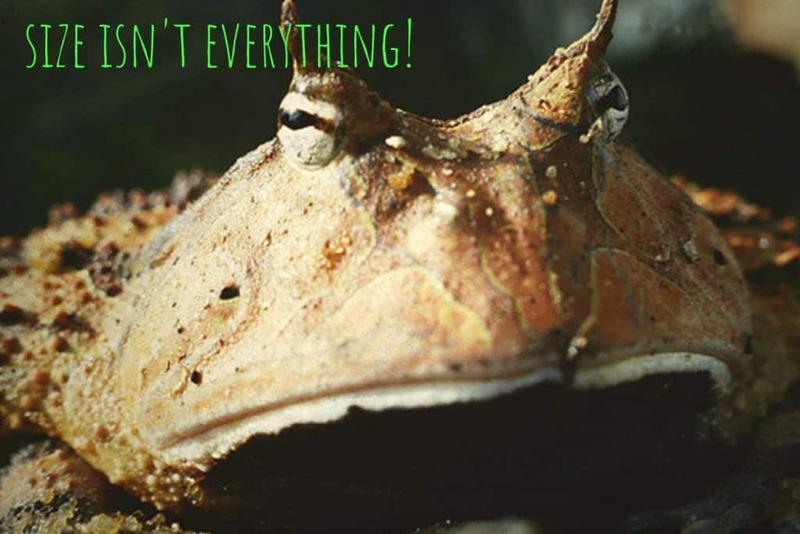 · The Amazon Horned Frog is about the size of a coffee cup and uses its camouflaged body to bury into the underbrush with only its head above ground. If any potential prey comes it’s way, it leaps out and swallows it whole. · Frogs stop growing once they reach adulthood. · The Goliath Frog is the world’s largest and found in Cameroon, Africa. Their bodies can get to an impressive one foot in length, with their legs reaching at least that again. · The Gold Frog, measuring just half an inch, was formerly the smallest frog in the world. But in April 2009, a new species was found in the Andes Mountains in Peru, the female measured up to 0.49 inches and the male a minuscule 0.44 inches. 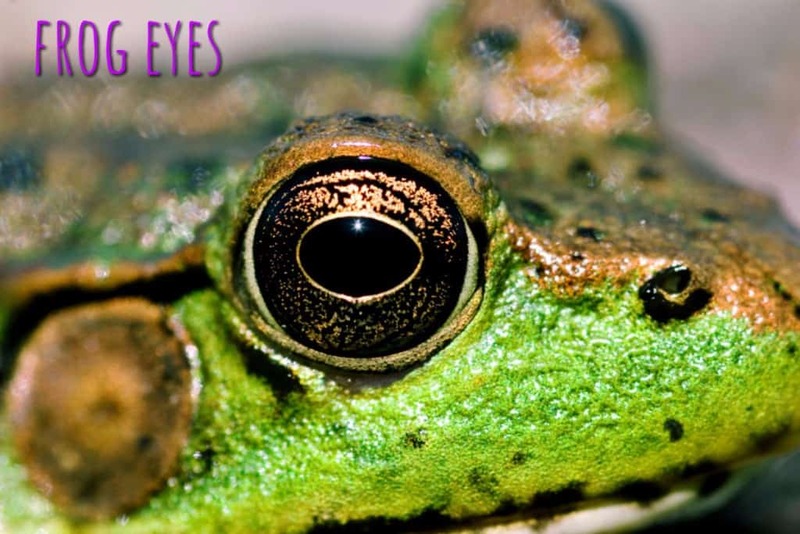 · Frogs can see in multiple directions as their eyes bulge outwards giving them extended vision. They can also retract their eyes, which is an essential attribute for helping them swallow food. · Certain species of frogs have a patch on the top of their head which acts like a third eye. It is sensitive to light and can effectively aid the frog in navigation. · Frogs have adapted to both land and water. They have developed a third eyelid which keeps them moist on land but not too wet in water. · A frog can only see moving things. It could literally starve to death with live prey in front of it if the prey never moved. 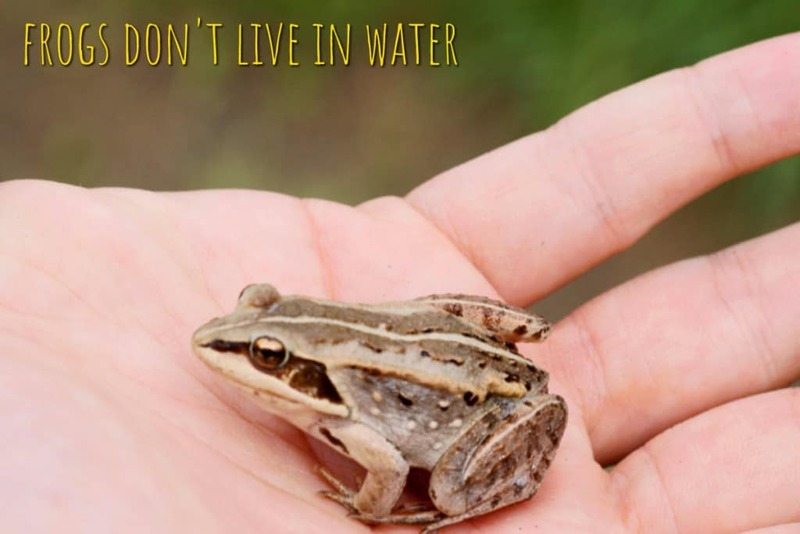 · Frogs will live around almost any water source, including swamps, marshes, lakes, rivers, streams, and temporary pools of water caused by flooding or rainfall. · The North American Wood Frog is the only species of frog found above the Arctic Circle. It has one of the most developed hibernation techniques on the planet. By freezing itself to the point its heartbeat stops and then dethawing in the spring and literally coming back to from the dead. 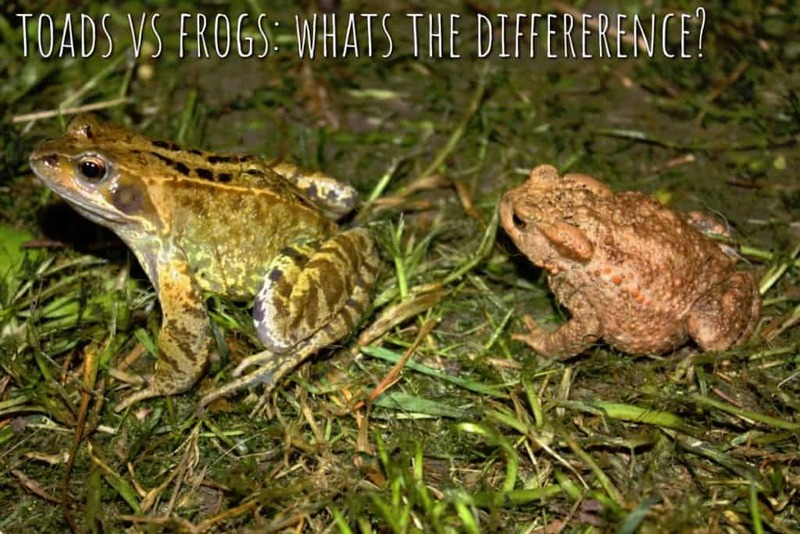 · Frogs are able to adapt to almost any habitat. In desert areas, they are able to survive on millimeters of rainfall a year. They plan their egg laying cycle around rainfall, with tadpoles turning into frogs in as little as ten days. · African Dwarf Frogs live mostly underwater, coming up for air every now and then. · Frogs can jump over 20 times their body length. 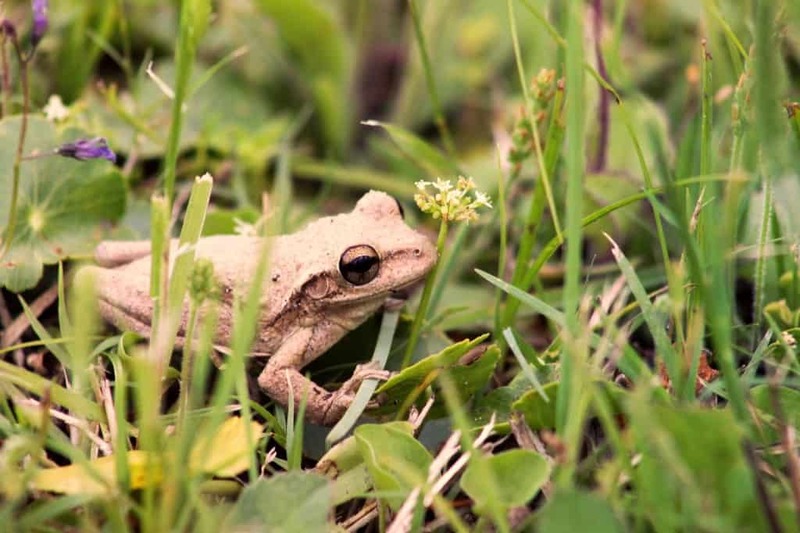 · The longest jump ever recorded was 33.6 inches, at a South African frog derby. · Tree frogs have pads on their toes with tiny bumps that cause friction, even on wet surfaces. 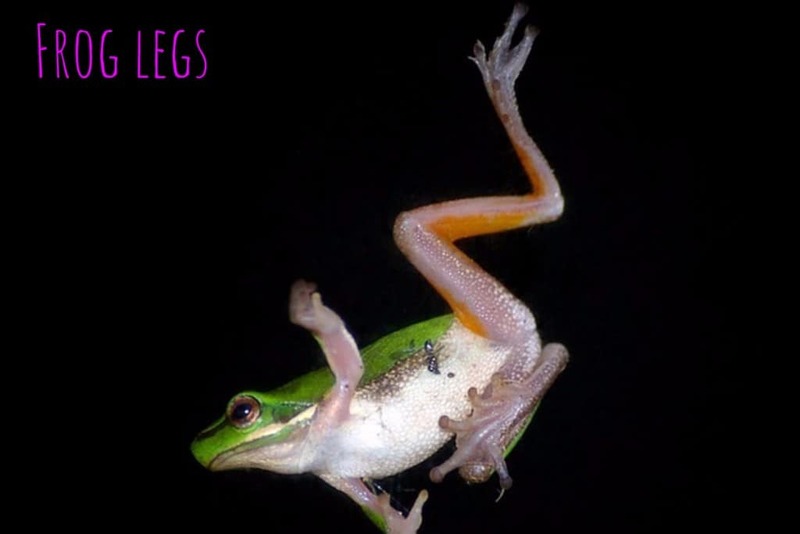 · The Costa Rican flying tree frog uses the webbing between its toes to act like a parachute as it leaps from tree to tree. · The study of how frogs adhere to slippery surfaces is being used to develop anti-skid devices in human technology. · Frogs breathe through three parts of their bodies: skin, mouth, and a membrane covering the inside of their mouths. Their skin takes in oxygen from their environment and they inhale and exhale through their mouths. · A frog’s sticky tongue is used similarly to fly fishing. When it sees a meal, it casts out its tongue and reels it back in to swallow the meal. · Some frogs like the Squirrel Tree Frog have large sacs that expand to resonate sound. Some frogs can make sounds without any special sac. · Frogs call out for different reasons; mating calls, territorial calls, weather announcements, and cries for help. · Male frogs are the only ones who sing, to attract mates and warn off other males. 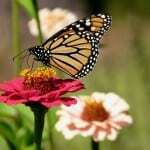 Females listen to the mating song and choose a mate by who sings the loveliest. 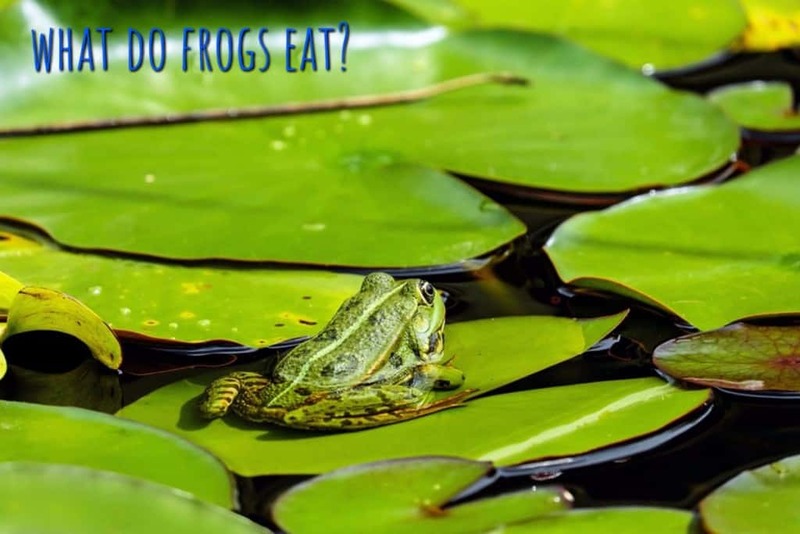 · Frogs are carnivores, meaning they eat meat. The largest of frogs eat snakes, turtles, mice, chicks, bats, and even other, smaller frogs. 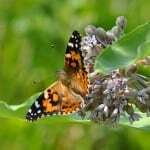 · Small frogs eat insects like flies, mosquitoes, and dragonflies. They will also eat snails, worms, small fish, and spiders. · Frogs don’t drink water the way that we do, they absorb it through their skin. Some frogs have areas on their bellies which can also absorb water. · Some frog species have teeth to help them hold their live prey, but they don’t use them to chew. 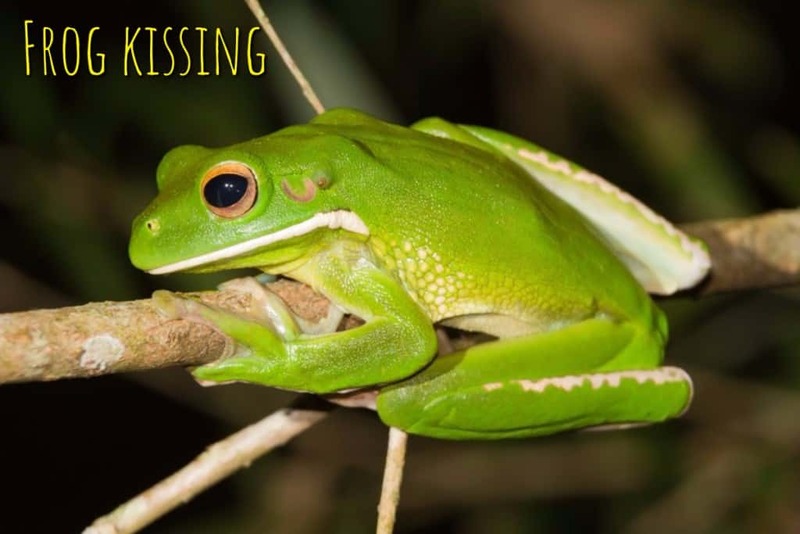 · Frogs who have no tongues use their fingers to catch prey and put it into their mouths. · Most frogs are either brown, green or earthy tones which blend in with foliage. 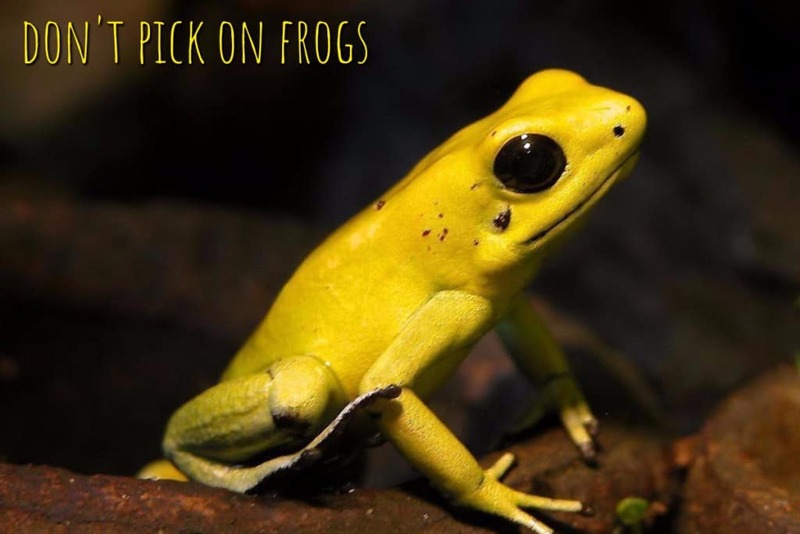 · There are also the frogs who are imitators of poisonous ones, like the poison dart frog. · The fire-bellied toad has a flash colour which he only displays under the threat of attack. This confuses predators and provides essential time for escape. · Some species, like the Chilean Four-Eyed frog, have a pair of bumps on their rear that are hidden until they’re in danger. By lowering their head, the larger rear portion appears to be the head of a larger frog. 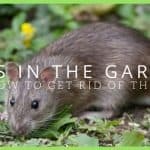 · Most garden sheds can be a death trap for frogs if they contain herbicides, pesticides, and other chemicals which are poisonous to frogs. · Some frogs use camouflage by remaining one colour for one season and changing their appearance with the surrounding foliage the next season. · The most poisonous animal is the Golden Poison frog which can kill ten humans with a single touch of its skin! · Some toads can live up to 40 years, but poisonous ones tend to have a shorter lifespan, at seven to 17 years. · A frog in captivity, if cared for properly, will generally live much longer than those in the wild. 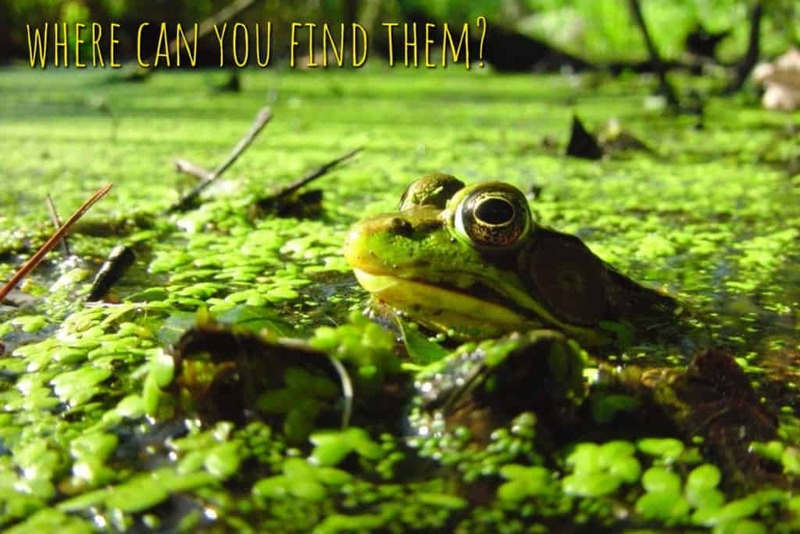 · Frogs lay anything from hundreds to thousands of eggs in water, and it is the males who fertilize them. 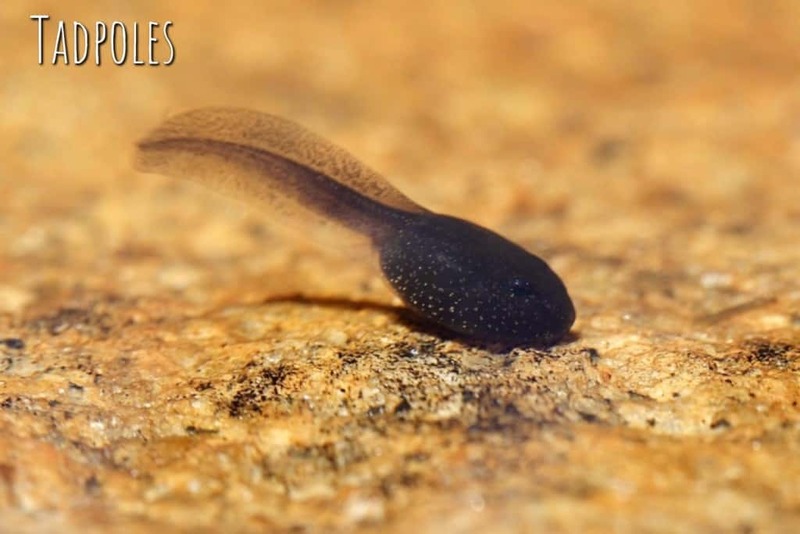 · Tadpole characteristics vary from species to species. Scientists are beginning to determine frog species apart just by their tadpoles. · One species of tadpole called the Axolotl, is actually a salamander that never grows to be an adult lizard, but retains its gills and fins and procreates at this stage. · Though most frogs abandon their eggs, some frogs carry the eggs on their backs, in their mouths, and the Marsupial Frog has a pouch for them. · Before touching a frog, always wash your hands. 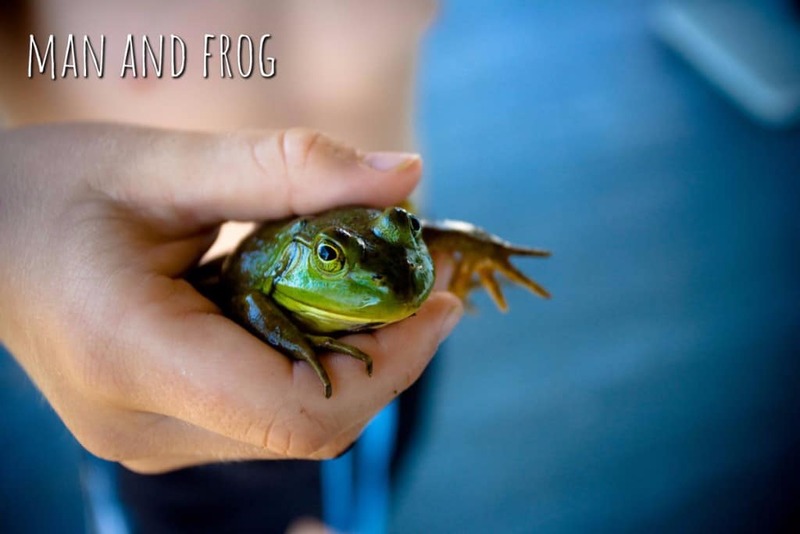 Sunscreen and insect repellent on human hands will kill a frog or toad! 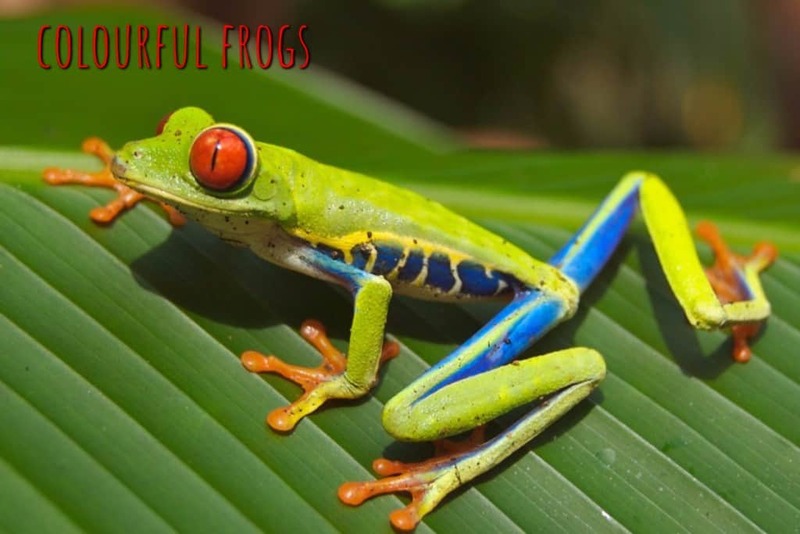 · Amazingly, Australian Tree Frogs emit a chemical substance that can heal wounds on humans. · You can get frogs to enter a state of relaxation by carefully turning them over on their back and gently rubbing their belly in a circular motion. · Warts cannot be transmitted from toads or frogs. This is a myth. · A waterfall or pond in a garden can help save frogs by providing them with a safe, chemical-free environment to thrive in.